Dead Man’s Hand card art. Not many know this, but Hearthstone matches are programmed to end in a draw after 90 turns, which typically amounts to about two hours of gameplay. Since each player takes increasing “fatigue” damage after running out of cards, no deck has ever had the resources to last that long. As a result, tournament organizers haven’t ever had to worry about the potential consequences of a 90-turn game of Hearthstone—until now. 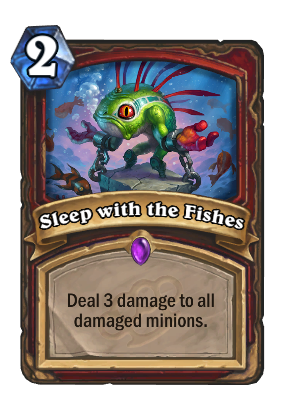 “Fatigue Warrior” is a type of deck that wins by killing off minions with powerful board-clearing spells like Sleep With the Fishes and Brawl, then draws out the game until the opponent runs out of cards and starts taking fatigue damage, which ultimately kills them. Since the deck’s primary aim is to survive for an obnoxious amount of time, it’s one of the slowest-playing decks to ever exist in Hearthstone. 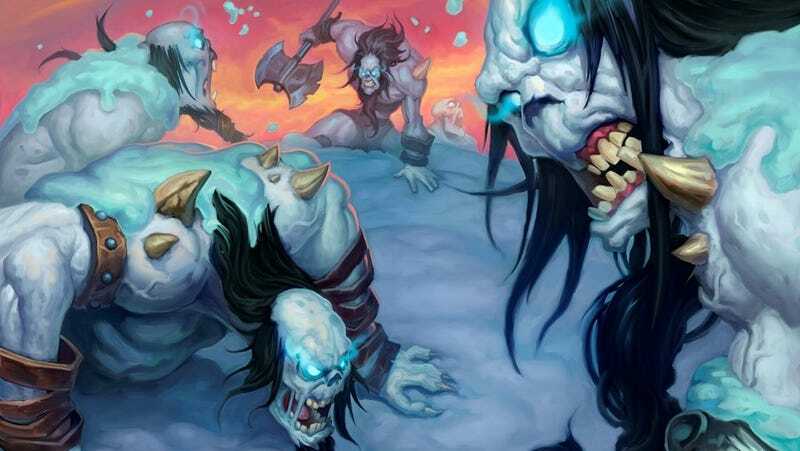 The thing is, Hearthstone is currently ruled by overpowered Druid decks, and most new decks are being specifically built to counter the class. Since Fatigue Warrior has always been a sleeper deck, nobody thought it might actually prove to be a valid competitive pick. A few weeks ago, pro player David “Dog” Caero reached the game’s highest ranks by playing a new spin on the classic Fatigue Warrior deck. By running Dead Man’s Hand, a new card that shuffles your current hand back into your deck, the new Fatigue Warrior has some unprecedented late-game power. If you’re holding two Dead Man’s Hand cards, you can shuffle the other one back into your deck ad infinitum, which means you’ll effectively never run out of cards. If you can survive your opponent’s onslaught in the early game, you can draw things out to a point where you can exhaust all their resources and win. In the past week or so, the deck has seen widespread adoption and will soon make its premiere in tournament play at HCT’s 2017 Summer Playoffs. This presents a problem: if two players are running Fatigue Warrior decks, and both of the decks are running Dead Man’s Hand, both players can theoretically just keep shuffling their hands back into their decks. Since neither player ever has to take fatigue damage, they can both survive indefinitely. The worst thing to happen, after two hours of playing a game this way, would be for the game to end in a tie. Blizzard already has a solution in place for this: if a game comes to the 90-turn limit, the player with the most health and armor wins. Since Fatigue Warrior has never been a common deck in professional play, and especially a Fatigue Warrior deck that can survive to turn 90, it’s hard to know how this willl actually play out in a professional environment. Even in a Fatigue Warrior mirror, different decks may run different cards and get different draws. One of the players might go for a more aggressive game plan instead of trying to win in the long-term. 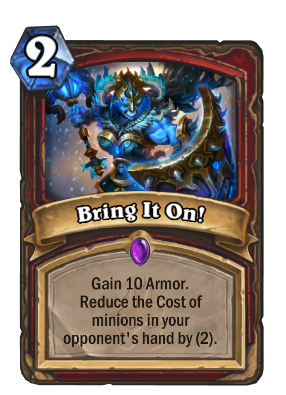 If we do see a Fatigue Warrior mirror match, we can expect it to run for the long haul, as players reshuffle their hands into their decks over and over, stacking ungodly amounts of armor for what could be hours. Perhaps one player will take a clear and untouchable lead on armor stockpiling, causing the opponent to forfeit the now-futile race. Maybe the tournament organizers will have to step in and cut things off or start the next match to keep the schedule moving. It’s hard to say. Once these rules are live, Fatigue Warrior players will need to come up with a game plan for potential mirror matchups. It seems likely, for instance, that both players may opt to duplicate their Bring It On cards toward the end of the game, then play them all in an attempt to stack armor points for the win. Knowing this, the other player might run a card or two to try to counter such a strategy. While nobody necessarily wants to sit through a two-hour Hearthstone game, the potential for new strategies and mind games is an exciting prospect.